CRImage provides image analysis tools for segmentation, classification, and downstream analysis of tumour section images. In particular, it allows cellularity scoring of tumours which can then be applied to correct molecular assay data for varying cellularity. The package also comes with a novel algorithm for copy-number data correction, given SNP microarray data and cellular content of the tumours estimated by the image analysis. Segmentation and classification of cell types. 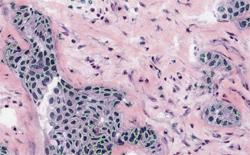 CRImage uses supervised classification techniques trained by expert pathologists to identify different cell types in H&E-stained tumour images. 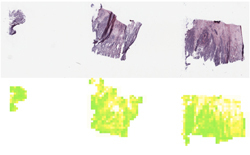 Automated image analysis results assist pathologists. For example, this heatmap shows the density of cancer cells in tumour sections. CRImage summarizes its results in quantitative cellularity scores for each tumour section. 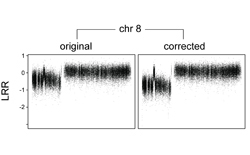 Quantitative cellularity deconvolution increases signal-to-noise ratio in DNA copy number data. Correcting copy number profiles for tumour cellularity helps to identify alterations that would be too weak to notice in a mixture with normal cells. You can download the package from Bioconductor. To install CRImage you need the EBImage R package, which requires: X11,ImageMagick, GTK+(optional). Here is an example step-by-step guide to install CRImage on Mac OS. Alternatively, you can use fink to install most dependencies of EBImage and CRImage.